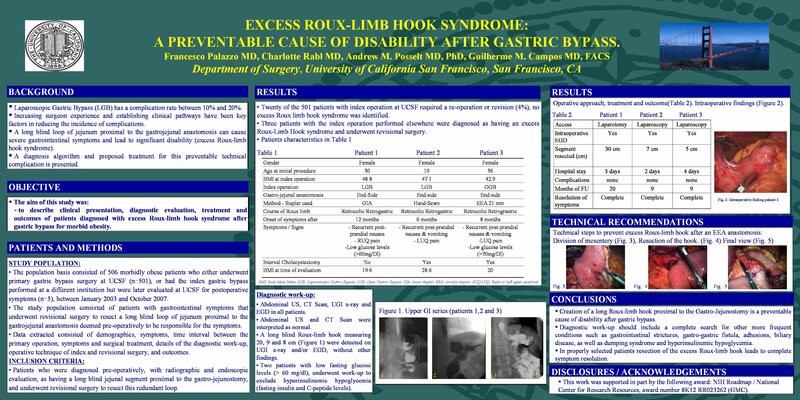 Excess Roux-limb Hook Syndrome – a Preventable Cause of Disability After Laparoscopic Gastric Bypass. Introduction: Laparoscopic Roux-en-Y Gastric Bypass (LGB) is associated with a complication rate of about 10% and early diagnosis and proper treatment leads to full recovery in virtually all patients. Strategies to prevent technique related complications are important and should decrease overall morbidity rate. The aim of this study is to describe a preventable cause of disability after LGB: an excessive length of the blind loop (hook) of the Roux limb, detail its treatment and outcomes. Methods: A retrospective review of a prospectively maintained Bariatric Surgery Database with 595 patients to search for patients that required revisional bariatric surgery for resection of the hook of the Roux limb for severe gastrointestinal symptoms after LGB. Clinical information, diagnostic approach, treatment and outcomes were noted. Results: A total of three patients were identified. Two LGB had been performed at outside institutions, while one was performed at our institution. Average time between LGB and symptoms was 3, 5 and 6 months. All patients underwent preoperative gastrointestinal series and endoscopy documenting an enlarged hook of the Roux limb. Surgical treatment was undertaken after failure of dietary modification. All patients underwent laparoscopic resection of the hook of the Roux limb. The redundant blind loop measured 7cm, 10cm and 12 cm. Postoperative course was unremarkable in all cases. Symptoms resolved promptly and at 3, 6 and 9 months follow-up all patients remain asymptomatic. Conclusions: An excessive length of the hook of the Roux limb may cause disabling symptoms after LGB. Diagnosis includes standard radiographic and endoscopic evaluation. Laparoscopic resection of the redundant loop is safe and resulted in symptom resolution in this small case series. Attention at avoiding a redundant blind loop of the Roux limb during LGB can prevent this syndrome.